Tetris Plus was the only Tetris game released for the Sega Saturn in the United States, and is a port of the 1990 Japanese-only arcade game of the same name. Along with the requisite “Classic” and “Vs.” modes, Tetris Plus features a “puzzle” mode (isn’t the whole game a puzzle?) that is really the meat and potatoes of this release. In puzzle mode, you help the archaeologist, known only as “The Professor” navigate through ancient tombs by clearing the blocks standing in his way. It is your job to get him to the bottom of the pile (marked “GOAL”) before the spiked ceiling, which descends periodically, kills him. The catch is that he will constantly climb to the top of the pile if he doesn’t have a space at least two squares wide in which to wait, even if that means that he is climbing right up into the spikes and his own death. 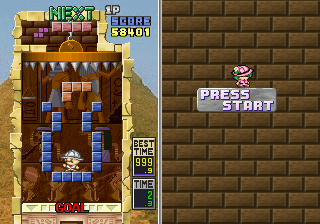 There are 4 excavation sites of 20 puzzles each, for a total of 80. In each area, the puzzles get progressively harder, but you have as many chances as you need to pass each one. The trick to completing each puzzle is to figure out which blocks need to be removed first, as simply trying to remove all of the blocks as quickly as possible is not necessarily the best strategy in every situation. Vs. mode plays similarly to the puzzle mode in that each player is racing to get the professor to the bottom of the pile first. The game adds blocks to your opponent’s pile by pushing them up from underneath, which inches the professor closer to the spikes. The game also features an “edit” mode which lets you create and save your own puzzles. The game controls better than the Japanese-only “Tetris S”, but it still doesn’t feel as good as the older Tetris releases. I felt like I was fighting to get the blocks to move fast enough, and it took too long for each piece to be locked in place after it hit the pile. When you are racing against a descending ceiling of spikes, you obviously want to get blocks in place as quickly as possible. I don’t really like the way it handles, but the first time I booted up Tetris Plus for this review I played it for about 3 hours straight, so obviously the controls aren’t that bad. The puzzle mode really adds something new to the Tetris experience, and this game’s polished presentation and detailed graphics give it some eye candy as well. Buy Tetris Plus on GameGavel or Amazon. Tagged Jaleco, Puzzle, Review, Saturn, sega, Tetris, Tetris Plus. Bookmark the permalink.